What would Indian food taste without spice? Hard to imagine but we all love a bit of tadka in our food and this is where Indian spices make a difference. Well then it is time to wake up the taste buds. If the spices are overcooked or there is a bitter taste then it results in two things: that there is an unbalanced use of spices or the amount of red chilly added in the dish. Fresh Spices in Mumbai are available in different forms: (green chili, ginger, bay leaf, garlic, curry leaves) whole dried spices (cumin seed, coriander seeds, mustard seeds, cinnamon), and last but not the least without which the list of spices can’t be over – roasted and ground version (cumin powder, turmeric, chili powder). The five spices that you need to keep in the pantry to give a tangy taste to your food are cumin powder, chili powder, coriander, turmeric and garam masala. If you have no idea about these spices then you can easily try out the bulk section in the grocery store. One will rarely find an Indian recipe that requires seasoning on vegetables or meat with black pepper. This is because black pepper blends along with most of the Indian recipes such as garam masala, chai tea masala etc. This is the most important tip while using Indian spices. Always cook the spices and let them blend together first, before the acid element can be added (tomato, vinegar, lemon, lime). These acids need to be added later otherwise they will give a raw taste to the dish. The spices need to be stored in bottles and that is because once they are exposed there are chances that will get moisture. Even plastic shouldn’t be used as it will absorb the spices color and flavor. 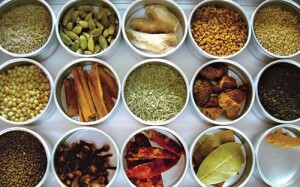 To look out for quality spices in Mumbai then visit evergreen exports to know the essence of these spices. This entry was posted in indian spices, Spices in India, Spices Masala and tagged Indian spices, spices in India, spices Mumbai.